Enabling change, empowering staff, improving quality. 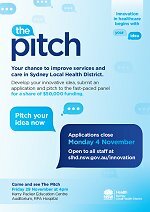 Sydney Local Health District embraces, encourages and supports a culture of innovation through its innovation challenge - The Pitch. The Pitch empowers staff to 'pitch' their innovative idea - no matter how big or small - to improve our system, better the patient experience, enhancing delivery of healthcare and minimising waste. 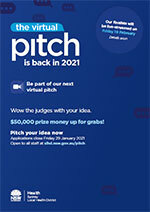 Click here to complete the one page application to register your innovation project for The Pitch. If you would like assistance with completing this form, please contact the Performance and Redesign Program Managers, Stephanie Laurent 9395 2049 or Barbye Castillo on 9395 2320.